It is hard to imagine the world of cigars without Rocky Patel, and yet just 15 years ago Patel was transitioning from being an attorney in Hollywood to starting his cigar company, originally called Indian Tabac. In just a couple of years Indian Tabac had managed to make its mark on the US cigar market, especially with cigars like the Super Fuerte, arguably the original rich “super stong” cigars. In 2002 the name of the company changed, allegedly over licensing clashes with Indian Motorcycle Co., to Rocky Patel Cigars and over the past 8 years it has released a number of iconic smokes like the 1990 and 1992 Vintage, the Edge, Old Worlde Reserve and clearly the Decade I am reviewing today. One thing that amazes me is the amount of flak Rocky Patel gets on the cigar web community; there clearly are a lot of people who like his cigars but his critics seem quite vociferous too, actually more vociferous than critics of other brands. Being pretty new to the world of non-Cuban cigars and the USA cigar market I don’t expect to fully understand the reasons for this, but it seems undeniable that Patel has been a major player in shaping what the cigar industry looks like today and deserves respect for that. 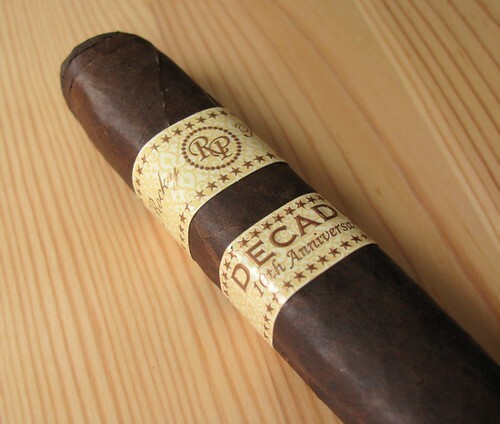 The Decade I am reviewing today was released together with the ITC 10th Anniversary reserve to celebrate 10 years of life of the company and to remember the adversities Rocky Patel needed to overcome to make it. In his own words, being an outsider (i.e. not part of a traditional cigar making dynasty) he had to fight hard to get respect, to get the tobacco quality he wanted and to build the relationships that help him in his success. The cigar was actually released somewhat later than the real 10th anniversary of the company because apparently it took longer than expected to find the right blend and the Decade blend was originally penned down for the ITC 10th Anniversary , but got swapped around at the end. The Torpedo made the Cigar Aficionado 2008 top 25 list and received an “Epic” rating from Cigar Insider which rapidly made this a much sought cigar. But now, let’s get smoking! Price: I had real trouble finding these online, but there are a few web-based shops selling them; the best price I could find is 140$ for a box of 20. Although RP cigars have started appearing for sale in Europe I have never seen the Decade for sale in the UK. In Germany the Robusto sells for around €9,50 for a single, no boxes. NOTE: According to Perelman‘s both binder and filler are Nicaraguan. No sense in playing around with words, the cigar looks great: nice colorado maduro wrapper with small veins and an attractive sheen. There is a slightly thicker vein under one of the bands and the second layer of the double cap is stuck rough side up, but I am really nitpicking here. 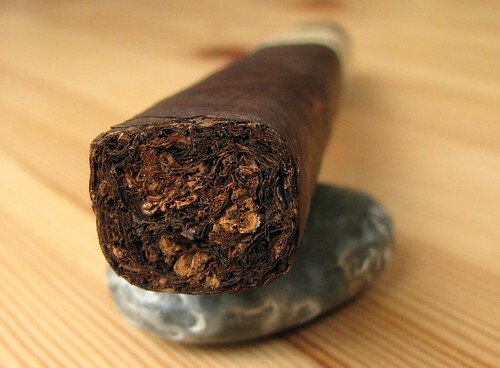 There are no soft or hard spots anywhere through the cigar, which feels packed but nicely supple. Once cut the draw is perfect and the aroma before lighting up has that typical maduro note (the closest thing for me is mocha) plus spicy and fruity notes. It certainly looks and feels the part of an impressive smoke. This is probably one of the best constructed cigars I have had in months. The burnline is extremely thin and almost picture perfect, quite a relief after yesterday’s Por Larrañaga struggle. The burn changes speed quite dramatically after the first third (more below), which is a bit odd for me but certainly not an issue. If you are an ash fetishist maybe you would be slightly disappointed as the ash doesn’t get extremely long (falls every inch or so) nor is it particularly strong, but I am not that bothered. Did I forget to mention the smoke? Plentiful and chewy, though not that creamy. The start of the cigar is pleasant, enjoyable but a bit understated. The main aromas are the typical maduro-like mocha notes (more chocolate than coffee) with a distinct but not overpowering pepper spice. The flavours are clean, clear but not particularly powerful. On top of these main notes. throughout the first part of the smoke there are lot of secondary tastes coming up: floral notes, sweet spices, dry cherry. Yet, instead of working to give rich complexity, they are so short lived that they end up being frustrating: you see that this could be a really elaborate smoke but it just never lasts more than one two draws. The one thing that is really fantastic is the finish because the aftertaste is long and intriguing. I generally don’t see the finish the interesting part of smoking a cigar, but this is different. Once you exhale the smoke a nice coffee and spice note remains for a few seconds, then slowly changes into tea (aged tobacco maybe?) and just when you think it is over it hits you with a light but clear aniseed note. The burn is a bit quick, taking just under 20 minutes to finish the initial third and leaves me wondering if this Toro will really smoke this quick. … the smoke is not that quick after all, it slows a lot once it passes the first 2 inches. The taste evolves a bit here: the maduro notes tend more towards coffee, there is a little nuttyness and sweetness till the midway point after which it is more cedar on subdued maduro notes. As before the taste is clear but not particularly intense and lacks a bit of complexity for my taste. For me the cigar really comes on its own in the last third. The flavours are finally bolder and gain complexity. They are dominated by coffee, wood and some leather pus light dry cherry notes. The aftertaste on the other hand becomes simpler, slightly bitter (which personally I don’t mind) on coffee and molasses notes, still enjoyable nonetheless. This is without doubt a quality cigar: well constructed, nice to look at and with clear smooth taste (and fantastic aftertaste). Still, as much as I liked those aspects, for me the first two sections lack the complexity I like and the flavour oomph which in my book should be in a premium smoke. I would expect that many smokers who aren’t bothered by complexity too much would absolutely love this. For me, this is a touch below the Old Worlde Reserve Maduro, which is my favourite Rocky Patel cigar from the few I tried, and so it gets a decent but not ecstatic 89. It certainly is a very consistent smoke: the two I had for this review were almost identical, so I wouldn’t expect any bad surprises with the RP Decade. … By the way, Rocky Patel announced a while back on Twitter that they are down to the final 3 choices for the 15 year anniversary cigar. Something to look forward to. This entry was posted in Blend, Cigar Reviews and tagged Cigar Review, Maduro, Rocky Patel, Toro. Bookmark the permalink. I bought and smoked one of these at Nemacolin Woodlands last night. I’m not cigar connoisseur, but it was everything I could have wanted from a $8 cigar. Took a little over an hour to smoke and had to relight only once. Great flavors, great value, great purchase. I will definitely be looking to buy more of these.